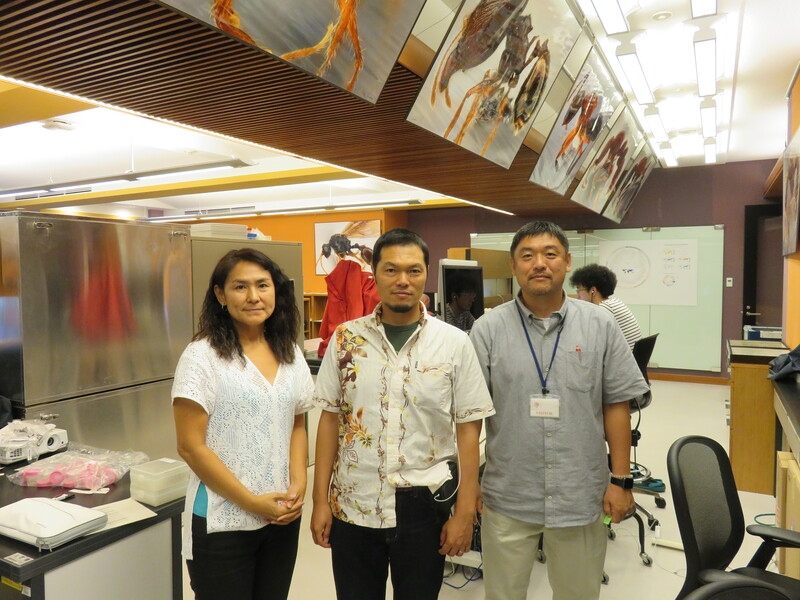 How can OIST’s OKEON project collaborate with Okinawan society so that both benefit in some way? While there are many different ways to answer this question, one important collaboration is with high schools in Okinawa. OKEON Chura-mori Project has been developing a new model of high school – university collaboration which benefits students, teachers and researchers alike. For the past year, OKEON has worked with Futenma, Kyuyou, Kaiho and Hentona High Schools. 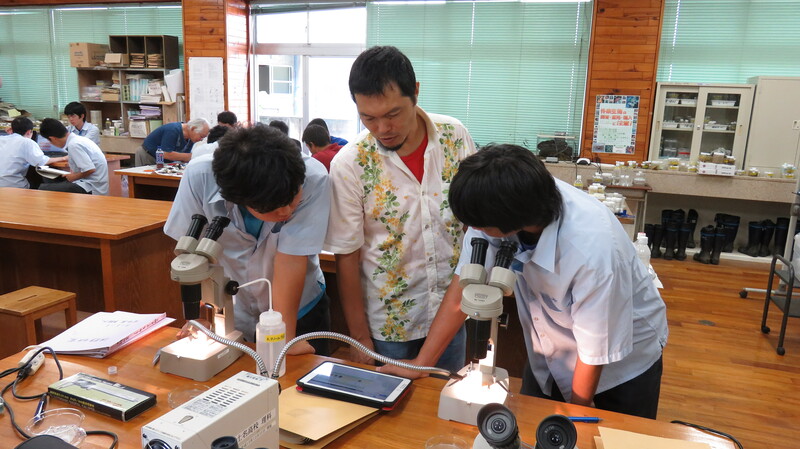 Each school has collaborated with OKEON in slightly different ways, but students have primarily focused on ants found in their local area as the material of their school research activities. Planning and conducting scientific research is often beyond school curriculums, so in order for the high schools to take part, OKEON project leaders Yoshi and Masako created a training programme for high school teachers. The programme involves lectures, and a course for planning research, collecting, sorting, mounting and identifying ants. By taking part, teachers can gain the skills and know-how to create their own research programmes using data from the OKEON project. For Kawabata-sensei, his study of ants during his university years led him to have a personal interest in revisiting the laboratory. 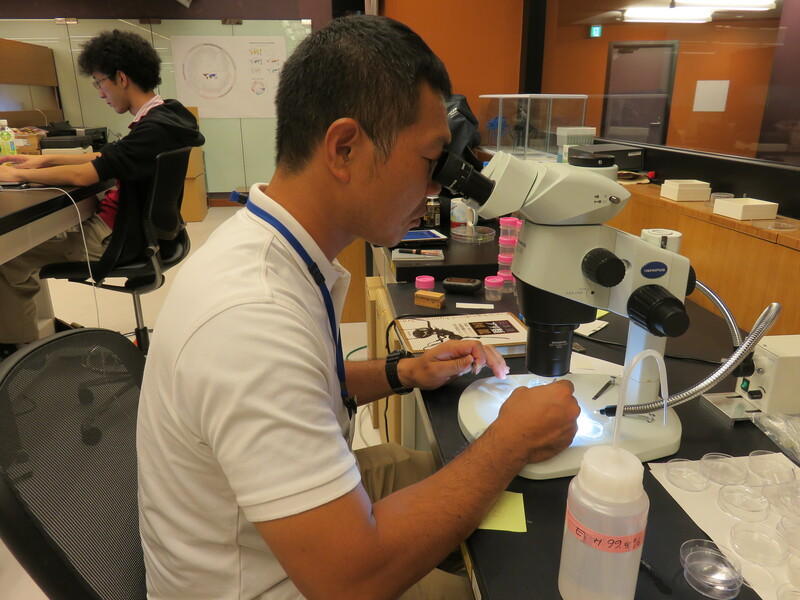 Takara-sensei did not research biodiversity at university, but having done Time-Unit Sampling at his school for a year before taking part in the programme, his ability to identify species is already extremely high. Both teachers spoke about how they were looking forward to working with their students to come up with a research plan using their new skills based on current research. Their goals included wanting to encourage students to develop their interest in science and research, but also to create a knowledge network between teachers which exchanges information, and has access to but is not dependent on a university faculty. The high school teachers trained by OIST will have the skills and know-how to implement environmental monitoring activities and research, and specialist biodiversity data collection. These skills will in turn be passed down to the next generation of high school students. Once a full cycle has been completed (the student’s research is generally for a year), teachers and students can develop and improve their research methods, thereby improving the scientific capacity of the entire community. Because each high school will have unique ways of researching and contributing to OKEON, as well as different goals, there is scope for a self-sustaining network to evolve where teachers and students can share research methods and data. This high school teacher training programme is valuable to OIST and OKEON for two main reasons. The first is that there are enormous amounts of data being generated through OKEON, and the sampling system is currently focused on winged insects. 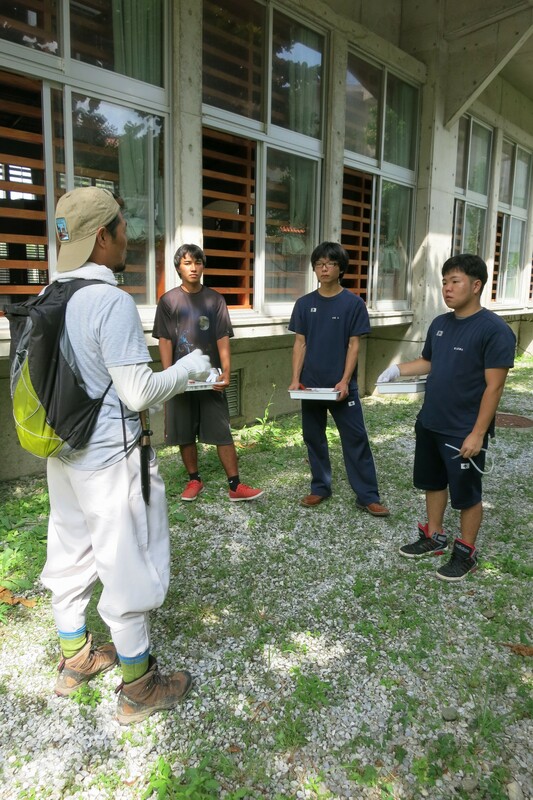 Students will be able to focus on worker ants in their local area, generating data which can become the basis for further research at OIST. The second reason is that this programme is a way to contribute to the sustainability of Okinawan society in the broadest sense possible. Through the training of high school teachers, OIST and OKEON can contribute to education in Okinawa. 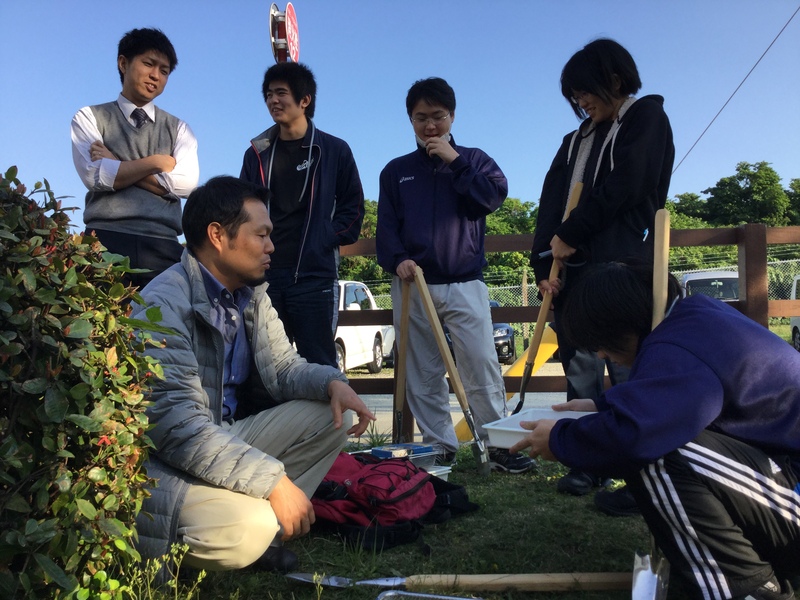 At Hentona High School, for example, there are specific classes pertaining to the environment, within which this research can become an important component. 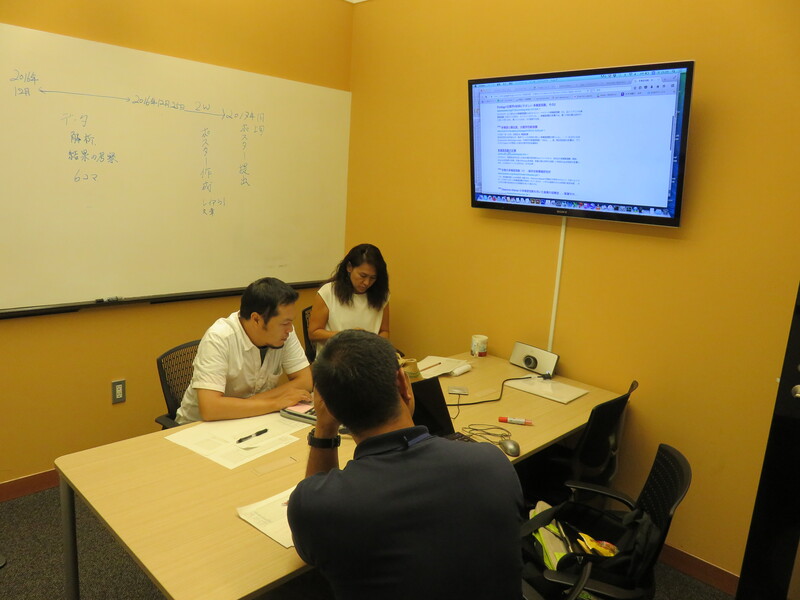 Students can take the specialist research skills they learn into their further study, perhaps even coming back to OIST to work with OKEON data. 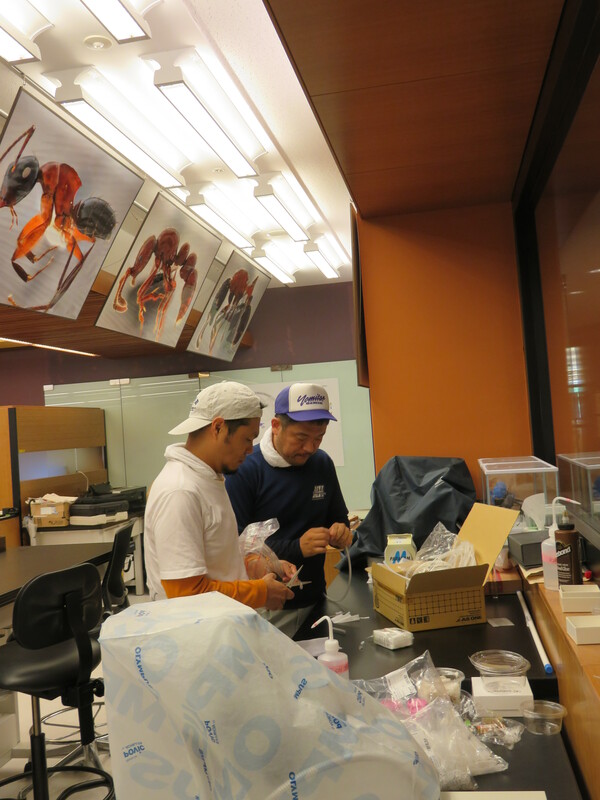 OIST can play an important role in allowing a strong research community in Okinawa to flourish, which will have the capacity not only to understand but to appreciate and protect the biodiversity of the island.